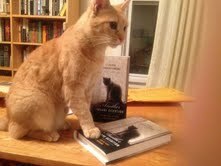 Peter Trachtenberg, author of Another Insane Devotion: On the Love of Cats and Persons (DaCapo Press) explores love, marriage, death and longing through his relationships with both cats and people. The narrative begins when his cat Biscuit, the golden kitty, goes missing while his wife is abroad and he is teaching in North Carolina. While Trachtenberg deliberates whether to travel the 1400 miles round-trip to search for her (spoiler alert—he does) he begins to unravel the beginning of the end of his marriage. Somehow he does this in a way that’s more than memoir—rather, it’s an exploration of what memories actually capture (or fail to capture). If we are meant to love something that is useful to us, but we don’t have mice, does it mean that cats are useless? And if a contract of marriage is ultimately a matter of successfully playing out the roles of husband or wife—but unfortunately not of a lover—what does it mean then for love? Trachtenberg posits that we can’t help but love what doesn’t serve us to love. Even cats, in their relationships with us, may have ulterior motives, but isn’t that also true with our human love objects? I had the opportunity to study with Peter while he was in North Carolina, and the honor of reading the first small essay about Biscuit’s disappearance that later became Another Insane Devotion. We’ve kept up a correspondence over the years, and we had the pleasure of Skyping recently, each with a cat nearby. PT: Well, among cat specialists there’s a debate as to why cats bring you mice and other things that they’ve killed and deposit them in the house or on the porch. And there’s one school of thought that they bring it as tribute to a social superior, and Leyhausen’s idea is that they are treating the human as a deputy kitten. That is, as a helpless creature that doesn’t know how to fend for itself and needs to be brought food and shown eventually how to hunt. And I buy the second because who do cats treat as a social superior? They’re not like dogs. Your three cats now, you feel they treat you like a deputy kitten? To a certain extent. Or like a mom or dad. They certainly want affection. I have a routine in the morning where I either meditate for an hour or read—I read Proust for an hour. The moment I sit down at least one cat gets in my lap, often two. Which can be distracting but it’s also very comforting. And that feels more like they are mothering you or you are mothering them? No, I’m mothering them. I’m the source of comfort. If I stop petting them I hear about it, or I get a signal. I thought about this deputy kitten thing when I was at a friend’s house with a cat with whom I have a nice relationship, and the cat started grooming me. [The owner of] the cat said that she had only ever seen the cat do that with her husband, who also possibly has this, like, helplessness about him. But I really enjoyed the idea of being her deputy kitten. Well, research shows that the cat that does the most grooming in any sort of multi-cat household is the dominant cat. It’s also the cat the beats up the others the most. It’s not like people. [Have] any of your cats in past relationships not been interested in you? I would say that F.’s [F. is the character of Trachtenberg’s ex. 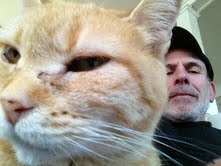 wife] cat Tina, whom I call by name in the book, the timid orange tabby, was afraid of me until quite late into our relationship. And F. had to go away for awhile. This is when I still had [a cat] who Tina was terrified of and rightly so. And I would just take turns sleeping in different bedrooms so that the cats would always have company and I think she got that my intentions toward her were benign, and she would sleep with me and let me pet her. But this was about three years into our relationship and otherwise, you know, she was really not that into me and it was clear. Biscuit was pretty indiscriminate. Biscuit would take love wherever she got it. Did you feel longing for Tina? No, I can’t say I ever did. I felt protective of her. She wasn’t my cat. In a way it’s like people. Did I love her or did I like her? I certainly felt responsible to her or for her and there were certain traits about her that I did love, the way you do about a person, but I wasn’t bonded to her the way I was to Biscuit. If I had heard that Tina had gone missing I don’t know if I would have traveled 1400 miles to find her. It’s interesting because with my cat Madeline I definitely feel longing. While reading your book I realized that whether or not I believe cats teach me about love, I definitely felt like they teach me about longing. They are that perfect example of Proust’s idea of love that you quote in the book. Where our own love charms us and returns to us. It’s something that I don’t want to believe about humans but with cats its fair game to say that. Why don’t you want to believe that about humans? I don’t even know if it’s that I don’t want to believe; it’s just that I think there’s part of me that feels ashamed of it. With a cat, with Madeline especially, the longing I feel for her is very deep, but I can also feel that the way that I love her just charms me. In Another Insane Devotion, another cat who was lost earlier in the marriage, Gattino, changes that in a way. I will say that losing Gattino was devastating. It was devastating to both of us. It was more devastating to F. [ex wife]. And looking at it objectively I can’t say how much of what I felt was devastation at his disappearance and what I saw [F.] going through. Because I saw her in a continuous state of grief, and you can say it’s silly and it’s inflated and I certainly write about that. You can say that all grief is really inflated. But it’s real and you can’t reason it away. You love what you love, and you grieve what you grieve. There are plenty of people whom I don’t think are worth loving. For the Victorians, who made a cult of feeling, the death of a child had less impact and gravity then the death of a husband in a society where men were the sole breadwinners. So, you can say there are pragmatic reasons why we love what we love. The thing that’s miraculous about love is the way it defies what’s reasonable. That you may love somebody who doesn’t serve you to love, that you derive no benefit from. At one point in the book I talk about Aristotle and [his idea] that love—in order to be love—has to be an end to itself rather than a means to something else. The thing about a cat is that if you don’t have mice it’s a useless thing. There are all sorts of pressures, both economic and social, and logical, that make it difficult for us to love. That make all love, in a way, at least for people like myself and F., impractical. There’s something that you refer to [often] in the book as the practicality of marriage. In the book you mention that you had your composition students write papers about what makes a good boyfriend or girlfriend and those arguments have almost nothing to do with what makes a good husband or wife. So does a husband or wife, in that practical relationship, experience longing? Is that a fair emotion to apply to that structure? One doesn’t [experience longing] until one’s separated, maybe. Isn’t longing contingent partially on the not-fairness of the object? I think it’s interesting. I mean, F. was somebody who was probably not fully there, so I didn’t experience it as longing all of the time. It was longing with different degrees of keenness. Sometimes it was a very long needle that pierced all the way to the heart and sometimes it was like somebody jabbing me gently in the stomach with a finger, and I don’t know if she had the same feeling. And was the source of that, at that point, the possibility of loss, or what wasn’t accessible? It was partly [the possibility] and something that was inaccessible, withheld and hidden. If you really look at any person or any being, there’s always some part that’s inaccessible to you. Do you have a sense, if you really look, at that other person’s secret life? Which coexists with—I don’t know if it’s beneath the life that is visible, or if it is somehow braided with it. It’s mysterious and I don’t know if it’s all of what you love, but it’s part of it. I mean, longing is more the state of being a lover. I don’t think it completely disappears, but it’s subsumed by other states of being, the ones I characterize as delight and obligation. That’s what I think. And I think, you know, I would never presume to say what a healthy love is or a healthy relationship is, but I will say that it’s very healthy, and very satisfying when all three states exist, can exist in one relationship. And they sometimes do. What are the three states? Longing, delight and obligation. And obligation feels like a dirty word. We don’t like it. The way America works now is [that we] promote the fiction [that] nobody is obligated to anyone or anything. But sometimes somebody goes missing and you have to look for them and you can’t rest until you find them. Or somebody needs to be taken to the hospital when you want to sleep, or needs to talk late at night when you want to sleep but they’re really upset. And it’s not convenient—you have to work tomorrow [or] maybe you have a job interview and you may not constantly be moved by this great swell of love for the other person. But you know you have to. And that sense of necessity is in response to another person, but the other person may not be asking for it. The other person may understand that you want to roll over and go back to sleep. I mean, Biscuit has no sense, I doubt she has any sense of what I had to go through to look for her. It’s inconceivable to her. As I read your book I was thinking about this idea of the obligation, that contract of marriage, and I couldn’t help but wonder how my own marriage, a queer marriage, applies to this. In my situation, does husbandry happen from both parties? I’ve been wondering how much gets sequestered into our gender roles. Is it specific to marriage itself or is it specific to gender roles? It’s hard to say. I think it probably has something to do with gender roles. Also, you could say in a queer relationship, it’s like—do you really say that one person is the husband and one person is the wife? Does that really apply? No, I think it’s similar to the roles of the cats; it’s something that’s always shifting. Well, that’s maybe the great thing that queer relationships have to teach straight people. I think that does occur somewhat in straight marriages. Researchers found that traditionally what happens is men who are dominant, very dominant and confident and dealt with the world in their thirties and forties, in their fifties often undergo a change and become needier: more inwardly focused, more concerned with relationships. At the same time their wives are often becoming more ambitious and less interested in their families and more concerned with the outer world. There’s a shift in roles that goes on. I wonder how much of that plays a part with the roles we want to be playing. For [my partner] and I, sometimes it feels like the tension will come out through playing the role we don’t want to play. So in moments when I’m being much more of a husband, I realize I do prefer the role of the young beloved. So the tension comes from either pushing each other into the roles we don’t want to be in or want to be in, but at the wrong times. I wonder if that’s kind of the case with estranged marriages, a term that you mention in the book which is useful, but has gone out of use? I think that’s one of the challenges in a long, intimate relationship; you see the other and you see yourself in an unflattering light. You know, it’s the way Adam and Eve saw each other after the fall. That is like the pain of marriage. Of course, the challenge of marriage is to see yourself and the other, and forgive that which is not made to excite desire and to love it anyway, and then to see the part of yourself that’s like that and love that anyway, and accept it. I mean I’m articulating things right now that were not quite on the level of consciousness when I was writing the book. I could only think metaphorically. It’s related to the impressionist Bonnard, and how he used to keep brushes and paints in his pockets so that he could fix his paintings and sometimes that meant he would be fixing his paintings that were on the gallery walls or in his friend’s home. So Bonnarding is a term that means endlessly adjusting a creation even once it’s been deemed complete. I was thinking about that term while I was reading and thinking about memory because there are these moments when it seems like—and correct me if I’m wrong—it seems like there’s an attempt to revise: “If only we had looked in the oven.” And moments where you try to make sense of what went wrong: “It may be because I ran out of money.” Do you think that term relates? Do you think we refine these memories forever? Do you think we are Bonnarding these memories? Oh yes, completely. That’s what regret is. It’s also age. It’s time. Someone was telling me this theory the other day that when we remember things we’re not pulling them up from a filing cabinet. It’s your neurons firing the way they fired then. So you’re reenacting with changes, because they can’t fire in the same way. Now, I don’t know if that’s really the case, it’s persuasive in some ways. In the book there are the two moments where the narrator, I, proposes to F. with different outcomes. I would say in a way they represent different states, or different rememberings of the incident, and I would say that in a weird way the memory is more intense than the actual moment may have been partly because it is heightened by the fact that we are no longer together. That I’m not or may not be as happy as I was in those moments. Or feel as vulnerable. So they are heightened by the retrospective quality. Was it a matter of memory or artistry to include the double proposal? It was a choice. It was partly, the art was to represent those states of memory. I probably had that oscillation for ten years, of not being able to quite remember what her response had been, but I made the conscious choice to represent both states. Just like I made the choice elsewhere in the book to revisit certain exchanges or certain incidents or to introduce another detail and that reintroduction recreates how you come back to something. That whole process seems familiar, like how Proust goes on at length to make sure that a detail or a moment is rendered correctly. But rather than it being all in one go, it’s like you did that throughout the text. The book… what’s that word… the past tense… the noun would be accretion. It’s a book that accrued in some way. It begins in the present tense. It begins chronologically where it’s ending, essentially. What changes is the accrual of memory and the accrual of detail. The narrative that moves forward in time is really the narrator’s search, or my search for Biscuit. How do you feel now that the book is in the world? Do you want to be carrying a pencil in your pocket and endlessly revising it or do you feel like it captured what you intended for it to capture? I feel like I could endlessly revise it but I feel that it has got to rest and be what it is and stand as it is. Part of the pleasure of writing it was the pleasure of finding stuff out. It was a very pleasurable book to write as opposed to the Book of Calamities (Little Brown & Company, 2008) so in a way I’d love to stay in it. I’m always thinking of certain things that I’ve missed and would have liked to see in it. But I think it just has to stand. In whatever way it turns out to be inadequate or misshapen let it stand that way. I guess that’s the pleasure and difficulty in encountering the questions of love, and memory, and devotion, and cats. You’re approaching topics to which you’re continually changing your answer. Yeah, because I hope to experience them all until I croak. Corinne Manning is a writer and teacher in Seattle, Washington where she co-runs The Furnace Reading Series. Her work has appeared in The Oxford American online, The Ploughshares Blog, Drunken Boat, and Arts & Letters. She was the 2010/2011 Writer in Residence at the Hub City Writers Project. She's currently at work on a novel.